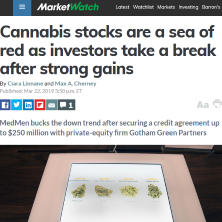 Cannabis stocks were a sea of red Friday as the broader market tumbled, leading investors to take the opportunity to lock in recent gains. The Dow Jones Industrial Average was down more than 400 points after weak data out of Germany and the U.S. that stoked global growth fears. The flight out of stocks led to a rally in bonds that caused the spread between the three-month Treasury bill and 10-year note to invert for the first time since 2007. A yield-curve inversion is generally viewed as a harbinger of an economic downturn. Jason Wilson, a partner in the ETFMG Alternative Harvest ETF MJ, +0.03% , agreed that the market has run up strongly in 2019.